The Osun State Police Command Wednesday paraded two people suspected to be realists who specialize in duping and defrauding unsuspecting members of the public under the pretence of being herbalists. The two suspects paraded by the state commissioner of police, Mr Fimihan Adeoye at the Force headquarters, Osogbo are Yusuf Taofeek, aged 21 and Jimoh Sherif, 20 . Fimihan said the suspects were arrested on 6th October, 2017 upon tip-off by some vigilant residents of Jamodo junction, Ifon-Osun, where their shrine was uncovered by the police. He said it was revealed to Police Operatives that some cultists /ritualists with code name “ZONE II” (Two) at Jamodo junction, Ifon-Osun, headed by one Sehidu Aliu, also known as ‘Alaga’ who is presently at large, usually assemble at their den. According to the CP, “the syndicates specialise in duping and defrauding unsuspecting members of the public under the pretence of being herbalist and to make money rituals for them. 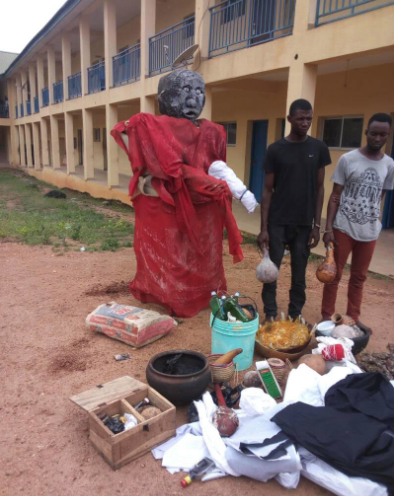 “Investigation led to the discovery of their den/shrine at Isangbe village in Ifon-Osun, where outrageous statues made of cement, carved wood, foams, assorted charms, cloths, empty schnapps bottles used for sacrifice to the purported Sango (god of thunder). “One of the moveable statues was removed to be tendered as exhibit. Also arrested is Yusuf Taofeek ‘m’ age 21 years met hiding in the ceiling of the house of Sehidu Aliu aka Alaga the zone II gang leader with a cutlass. “Other items recovered from the suspects are one unregistered Toyota camry saloon car and two Bajaj boxer motorcycles. Fifteen other members of the syndicate are at large. Investigation is ongoing.